No matter how carefully you care for your fresh flowers, they will eventually wilt if you do not preserve them. But preserving your flowers can keep them intact for years. 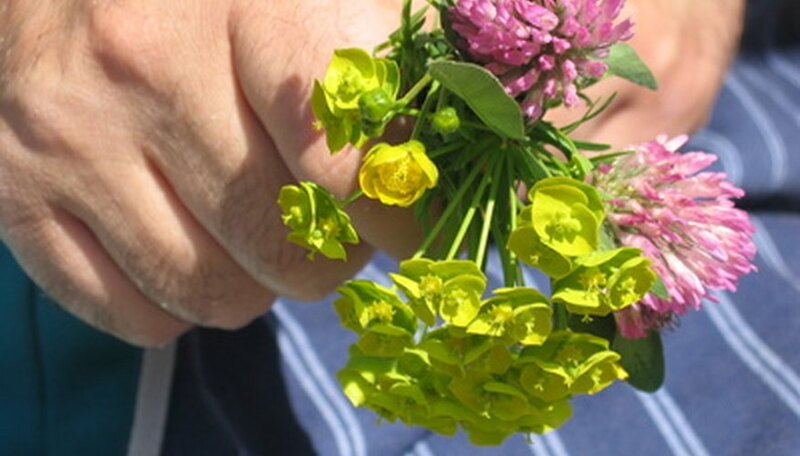 Preserve bouquets from weddings, birthdays and other important occasions or cut your own fresh flowers from the garden as a springtime keepsake to cheer you up when the weather turns cold. Air dry your flowers as an easy, natural way to preserve them. Remove the leaves from the stems and arrange the stems into small bunches or bouquets. Tie them together near the bottom with twine or rubber bands. Hang the flowers up in a dry, fairly warm place such as in a closet. Use twine to fasten the bouquets upside down to a clothes hanger or hook and leave them for two weeks. When you retrieve them, they will be preserved, dried flowers. Preserve your flowers with glycerin to keep them fresh and natural looking. Mix two parts of lukewarm water with one part glycerin in a tub large enough to submerge your flowers. You can also substitute automotive antifreeze. Cut fresh flowers that have not wilted and submerge them completely under the liquid and leave them for two weeks. Remove and hang the flowers upside down to allow the glycerin to drip out of the flowers and to make sure it penetrates and preserves the petals. Press your flowers to preserve them in a flat shape. Arrange your flowers on top of a layer of newspaper several sheets thick so that they do not overlap. Place several more sheets of newsprint on top of the flowers and place a piece of cardboard on top the stack. Then place a heavy book on the pile. Leave the flowers for four weeks. Use a drying agent to speed up the preserving process. Place a layer of silica gel in an airtight container such as food storage container. Place flowers on top of the gel and seal the container. Leave the flowers in the silica gel for 48 hours and remove. The silica gel will remove all water from the flowers within 48 hours. Flowers dried in silica gel may reabsorb moisture from the environment, causing them to wilt. If you live in a humid environment, display your silica-gel preserved flowers in an airtight case with a small amount of silica gel inside to keep the flowers dry.